The Boca Grande Woman’s Club has joined with the Boca Grande Fire Department and the Lee County Sheriff’s Office to build a new public safety dock for Gasparilla Island. This week the BGWC announced a $50,000 challenge grant to fund the project. The public safety dock is expected to cost approximately $100,000, and the remaining funds will come from the community. The dock will be located in the bayou on space provided by The Gasparilla Inn & Club. The location will reduce response time for marine emergencies. It will also facilitate the landing of a helicopter when needed for patient care and transport. The Boca Grande Woman’s Club was formed in 1948 with the mission of providing support and improvement to the Boca Grande community. Today the organization has 354 members and provides scholarships to students and grants to organizations supporting the island. Individuals or organizations wishing to contribute to the public safety dock project should contact Fire Chief C.W. Blosser at 941-964-2908 or bocafire302@comcast.net. 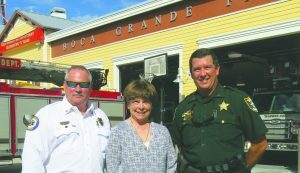 Contributions should be made to the Boca Grande Fire Department and mailed to P.O. Box 532, Boca Grande, Florida 33921.